Optimum mango ripening temperature is 70-75 F. Optimum relative humidity is 80-90%. Do not refrigerate the mango before it ripens. Refrigeration interferes with the ripening process. Never freeze a mango as freezing will stop the ripening process. A nicely ripening mango will be warm to touch as ripening is an exothermic process (a process where heat is produced). If the mango is cold to touch, it is not ripening well. Some mangoes release more heat when ripening than others. Sometimes a ripe mango can be frozen to preserve the fruit. 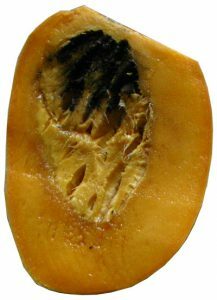 If a ripe mango is frozen, when brought at room temperature, tissue deterioration will be very quick, although the taste will be fine. This can be used for juice mangoes or for smoothies etc. Mango can be refrigerated after it ripens to increase its shelf life. However, the mango holds best at a temperature of 50-55 F. A mango can be refrigerated in some cases to increase shelf life. Different ripe mangoes however respond differently to refrigeration. Alphonso mango generally holds better and survives a few days. Fully ripe Kesar mango however has a very high sugar content and generally the sugar separates out from the pulp inside the mango. It is best to refrigerate Kesar before it is fully ripe. Banganpalli holds well in the refrigerator, but that also depends on the type of Banganpalli, whether it is thick skinned or not. Chausa holds well to refrigeration. We were able to keep a chausa for 3 weeks, it wrinkled due to loss of moisture, but tasted good. Avoid moving ripe mango in and out of the refrigerator. Ideally the ripe mango should be taken out of the refrigerator only for consumption. Ensure that the mango does not freeze when it is in the referigerator. 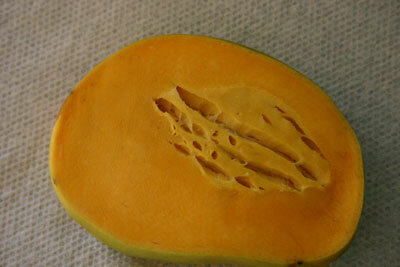 Following is a picture of a cold damaged mango. The survival of this mango is in the hands of God. Although it looks bad, it could still taste good. But mostly, it will only achieve a fraction of its peak aroma and flavor. 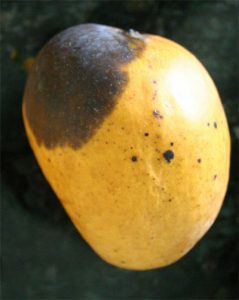 Small black spots generally show that the mango is sweet and has good sugar content. It is generally not an indicator of problem with the fruit, but use your judgement to make the distinction. Following is a picture of a very sweet mango. 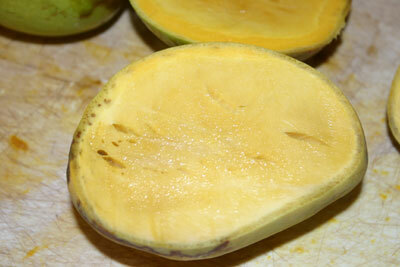 The small black spots actually indicate high sugar content, but unfortunately, the mango caught infection at the eye. The deterioration happens inside the tissue and there is a clear demarkation. Use the same judgement you use to judge any other produce item when dealing with this mango. Indian mango is extremely sweet and this whole fruit turned black within 24 hours. Mango ripens well in a dark place at the proper temperature and humidity. You can leave it in the special packing material it is packed in, but place it in a warm place. Some people place it in a brown bag with bananas. Bananas release gases during ripening which accelerate the ripening process of a mango. MANGO NEEDS TO BREATHE as it ripens- do not choke it in non-breathing material. Also constant poking can result in uneven ripening of the mango as dents prevent the free flow of nutrients in the mango which is vital for it to ripen properly. If conditions are such that the mango does not ripen within 7-days of arrival, this considerably increases the chance of the mango catching infection and not ripening properly. We treat our mango with love and respect. By following the above common sense directions, you can experience the heavenly taste of this fruit. Still why one ripe mango is better than the other- Good Karma always helps!! Not all fruit will mature to the optimum level, neither will every crop turn out great- such is nature. Mango is known as the king of fruits. It is regarded as the most heavily consumed fruit in the world. 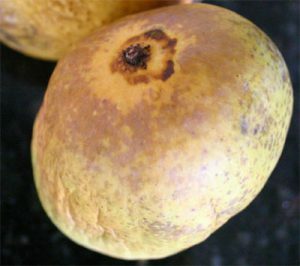 It is the national fruit of India, Pakistan and Phillipinas. Spongy tissue is a psychological disorder of the Alphonso mango (and you thought only humans could be sensitive). The mango looks good from outside, but is spongy inside. Spongy tissue cannot be identified in an unripe mango. However as the Alphonso ripens, the area with spongy tissue will not ripen and will remain devoid of any nutrients- it will generally be white and spongy, hence the name. We try our best to filter out the mangoes with spongy tissue at the source, but it is still an imperfect art and mango with spongy tissue does come through. Some crops have more sponginess than the others. Generally, if a small portion exhibits this, it can safely be scooped away without affecting the remainder. This is not spoilage by the elements, but a natural condition of the fruit. In some cases, the tissue which is not spongy can be extremely yummy in flavor as the whole ripening effort goes into the limited good tissue. However, sometimes the spongy area can deteriorate with time and also take the good area with it. Use your judgement as for any produce item to determine whether the fruit is good or spoilt. Smell, color, firmness, texture- all can be useful inputs to making a good decision. A quick little taste test can sometimes help. Picture1 shows a little spongy tissue which can be safely scooped away, Picture2 shows a spongy tissue that has become black. Below is a picture of a mango in which nothing is salvageable as the whole tissue is affected. Maybe there is a use for the tissue in this state, which is high in acid and extremely sour, but the tissue does not have any ability or nutrients to ripen properly- it will likely deteriorate henceforth.